According to the Centers for Disease Control, gum disease affects more than 42 percent of Americans over the age of 30. Additionally, gum disease is the leading cause of tooth loss in adults. When detected early enough, gum disease can often be corrected with increased attention at home, such as brushing more frequently, including antibacterial mouthwash in your daily oral hygiene routine and flossing both morning and night. However, if these at-home efforts fail to reduce inflammation and stop the gum disease, more advanced treatments become necessary. If you are experiencing symptoms of gum disease, call Contemporary Dental Health today at 503-636-4069 to book an appointment with experienced dentist Dr. Keith Ogawa. We serve the Lake Oswego, West Linn, and Portland areas of Oregon. Gum disease is caused by a bacterial infection beneath the gum line. The condition can affect more than just your dental health; gum disease has been linked to heart disease, autoimmune disorders and even cancer. Gingivitis is an all-too common inflammatory disease that can eventually lead to a more severe type of gum disease called periodontitis. When your gums become seriously infected, your body begins to fight the infection aggressively, harming your gums, bone and related tissue in the process. A number of factors can increase your risk for gum disease, including genetics, medications and lifestyle choices such as smoking, poor oral hygiene and poor nutrition. Gum disease can inhibit your ability to eat, smile and speak comfortably. It has been linked to several general health issues, such as cancer, rheumatoid arthritis and more. It can even delay your candidacy for other dental procedures, like porcelain veneers. Basic dental cleaning: When caught in its earliest stages, Dr. Ogawa may recommend basic professional cleaning to hinder the progression of gum disease. During this treatment, advanced polishing instruments are used to remove plaque and stains that have resisted your at-home hygiene efforts. Regularly-scheduled dental cleanings not only stop the spread of gum disease, they can prevent the condition from reoccurring in the future. 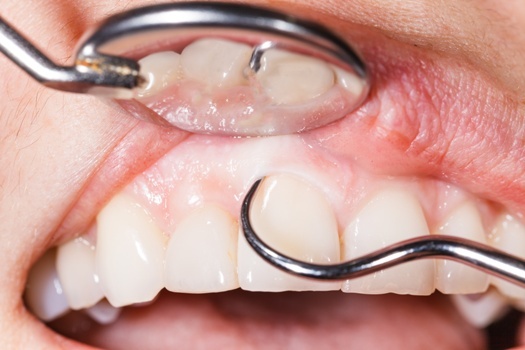 Deep cleaning: Deep cleaning involves the removal of tartar and calculus from below the gum lone. This assists in the reduction of inflammation and the elimination of bacterial infection. Scaling and root planing: Scaling and root planing remove plaque and tartar buildup and prevent tooth decay. This prevents the gums from being damaged further by bacteria. Both procedures are non-surgical. Once the plaque and tartar buildup has been removed during the scaling process, root planing is performed to smooth the surface of the roots in order to speed up the healing process and reduce the risk of future bacterial growth. Dr. Ogawa will evaluate your unique condition and determine the best approach to treat your gum disease and restore your oral health. To learn more about the gum disease treatment options available at Contemporary Dental Health, contact us today online or at 503-636-4069. We proudly help men and women from across Oregon, including Lake Oswego, West Linn, and Portland.